Wanda Lee Wilder was called home on Sunday, October 7, 2018. She was surrounded by her husband of 70 years, Robert Wilder, her three living children, and several grandchildren and great-grandchildren at the time of her death. She was born on June 6, 1933, to Clint William Littrell and Lucille Hensley Littrell in Asheville, North Carolina. After residing in Savannah, Ga., with her husband, Robert, she moved to Chattanooga, in 1957 and had resided there since that time. She was also a member at New Heights Baptist Church in Ringgold, Ga.
She earned two certificates at Chattanooga State in Pre-K as well as Key Punch. She went on to work at Cumberland Presbyterian Church in the daycare and later at Sears in the Call Department. She was the matriarch of her family and leaves behind a beautiful legacy of children, grandchildren, and great-grandchildren. She is survived by her husband of 70 years, Robert Perry Wilder. She is also survived by the children of her deceased eldest daughter, Angela Lee Wheeler of Texas: granddaughter Stephanie Lynn Bolyard and husband Christopher Ross Bolyard and their children, Megan Lee Bolyard, Haleigh Brianne Bolyard, Alexandra Shae Bolyard, and Emma Marie Kline. Also, her grandson Thomas Vernon Osborne III and wife Mandy Kathryn Osborne and their children Harrison Polk Chrane and Annie Kathryn Chrane, and grandson Robert Allen Kline Jr.
Wanda is also survived by her second eldest daughter, Sandra Lee Harper of Marietta, Ga., and her children: Grandson Kenneth Glenn Harper Jr. and his children Dorian Conner Harper and Glenn Mason Harper. Also, her grandson Brannon Chase Harper and wife Rebecca Elizabeth Harper and their children Zachary Lambert and Patrick Harper, and grandson Christopher Tanner Harper and wife Erin Michelle Harper and their children Ethan Hunter Harper, Collin Wesley Harper, and Madison June Harper. She is survived by her third eldest daughter, Rhonda Janice Oliver of New Bern, N.C., and her grandsons Wayne Oliver Jr. and Michael Oliver. Wanda is also survived by her youngest son, Johnny Perry Wilder and his wife Jan Wilder of Mapleton, Georgia and granddaughter Megan Michelle Wilder and her great-grandchildren Kaiden Ray Wilder and Aiden Eugene Wilder. She is also survived by grandson Jonathan Robert Perry Wilder. She will always be remembered for her love and commitment to family, unyielding faith, and even her love of shopping! 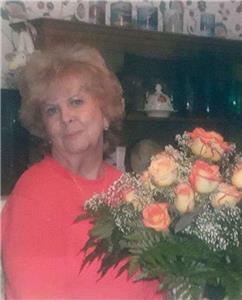 Her memorial service is on Tuesday, Oct. 9, at 2 p.m. at New Heights Baptist Church in Ringgold.